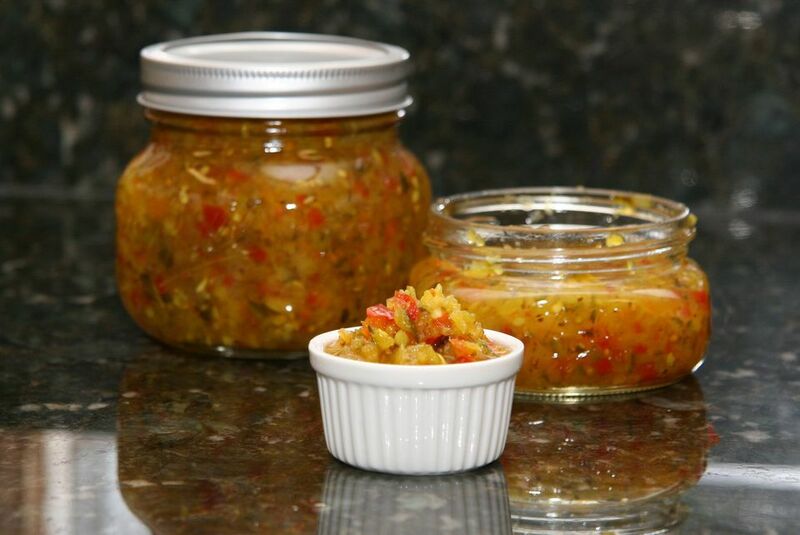 I used the coarse grind of my stand mixer's grinder attachment to make this sweet relish. This is a great relish for hot dogs or burgers, and it's a good way to use extra green tomatoes and zucchini. Finely chop the vegetables if you don't have a grinder. Put ground vegetables in a large nonreactive container with salt; gently stir to combine. Top with about 3 cups of ice cubes, cover, and let stand for 3 hours. In a large, nonreactive kettle combine the vinegar, sugar, spices, mustard seeds, turmeric, and garlic. Bring to a boil; reduce heat to medium-low and simmer for 5 minutes. Add drained vegetable mixture and bring slowly to a boil. Simmer for 15 minutes. Wipe rims with a clean damp cloth and seal with 2-part lids. Process in a boiling water bath canner for 10 minutes.